﻿ MCN Fleet: Should you splash extra cash on the XDiavel S? MCN Fleet: Should you splash extra cash on the XDiavel S? Ducati’s 1262cc space-age belt-drive super-cruiser comes in two guises, the entry-level £15,795 XDiavel and the range-topping XDiavel S at £18,395. 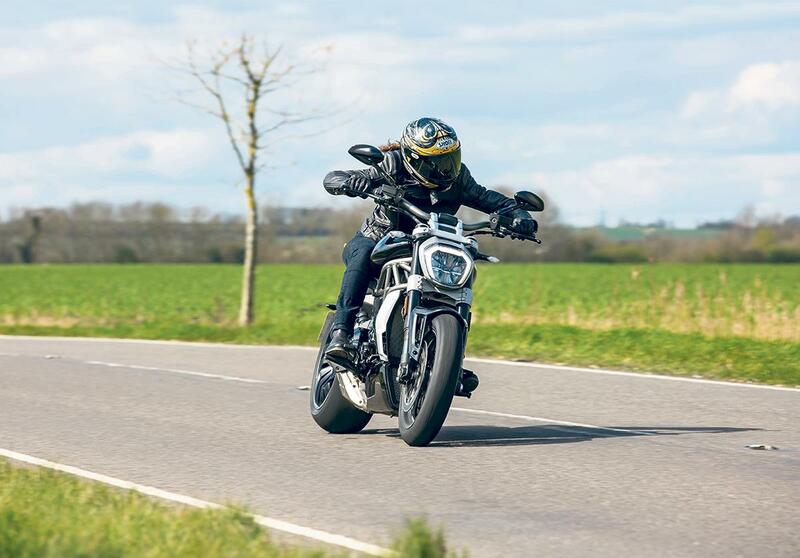 I’m running the S as a long-term test bike this year, but at first glance both look remarkably similar, which raises the question: is the XDiavel S worth the extra £2600? Both share the snorting 156bhp Desmodromic Variable Timing twin, generating a tarmac-wrinkling 95ftlb at just 5000rpm. But whereas the base model’s swingarm hides beneath black paint, the S blings out in brushed anodised aluminium. It’s a theme that’s shared with the engine too: the standard XDiavel’s motor is blacked out, while the S gets chrome-detailed belt covers. The other stand-out difference is the XDiavel S’s superbike-spec Brembo M50 calipers, exactly the same as those fitted to the Panigale. These titanium-finished aluminium monoblocs look stunning, but there’s little discernible performance difference compared to the XDiavel’s less flash Brembo M3 monoblocs and both are backed up with Bosch’s cutting-edge cornering ABS system. In fact both share the electronic rider aids package that offers three rider modes, three-stage launch control, hands-free ignition, and full-colour dash featuring three choices of display. But for me it’s the S’s 12-spoke wheels really make a difference. They’re the same size as the base model’s, but because the spokes run all the way out to the rim they look much bigger. Purchased separately these wheels cost £2563, and if you throw in the S model’s chrome-detailed cambelt covers (£170), it takes the running total up to £2733. That means if you buy the S model you’re effectively getting those stunning Brembo M50 calipers, Bluetooth connectivity and extra styling trinkets absolutely free!